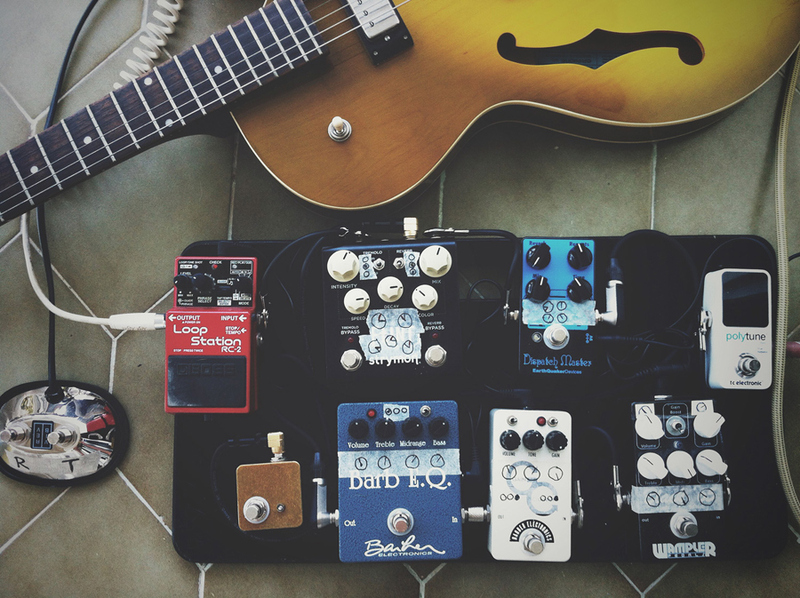 Today’s pedal line is from Tiago Pedroso. If you have a pedal line (doesn’t have to be in a board) for your rig, please email me a photo, bio, description of pedals and routing to pedalline@nulleffectsbay.com. Every Friday I’ll showcase a pedal line submission. Make sure you include any links to your band or music page. I’ve been reading your website for the last 3 to 4 months and thought I’d pitch in. I’m a webdesigner by trade and currently play guitar on an instrumental rock band in Lisbon, Portugal. Beyond the pedals pictured, my setup includes a 62 Reissue Epiphone Sorrento (Korean built hollow body guitar with USA Gibson electronics and mini-hums) and a 65 Deluxe Reverb Reissue (running clean on the vibrato channel). TC Electronic Polytune Mini > Excellent tuner. I’ve used the Polytune 2 before but traded down for this to save on pedalboard space. The big Pulytune 2 is has a brighter display but this works well enough for me. Wampler Black 65 > Oldest pedal on my board. I use it in boost mode, as a light OD as it gets dirty past noon. EQ is extremely powerful and makes this pedal highly versatile. The gain mode is a little boomy, but is definitely usable. I just don’t use it in a band context to avoid having to kneel in the middle of a song. Instead, I have a 2nd OD. Barber Gain Changer > My 2nd gain stage. The Barber GC is an evolution of their LTD pedals. It has 3 voices and 2 gain stages. I use it on the ligther gain stage, maxed with the standard LTD voice. Focused, clear, american tone that cuts well into any mix. Barber Barb EQ > I tried the Xotic RC Booster in this position before getting this Barber and, although its a good pedal, it added to much dirt. I needed a clean volume boost, not a gain boost. This does that in spades, but goes well beyond: in has a 3 way toggle for different “tone stack” sounds allowing you to turn your amp into either a 59 high power Tweed, a 60’s Blackface or a late 60’s British amp head. I use the tweed voicing as it fattens up my lead tone quite nicely. Also, the midrange knob has a push/pull switch that when “pulled up” emulates the bright input on the tweed and British setting (useful when playing darker guitars). Earthquaker Devices Dispatch Master > Delay & Reverb in a box. I use this almost exclusively as a delay pedal but the reverb on it is excellent. It’s usually white and blue but they did a run of black and blue DMs this year. I bought it used a couple of months ago and love it, although the switch feels a little stiff (not sure if its an EQD thing or if it’s a fault on my unit). Strymon Flint > The ultimate Tremolo & Reverb box. Seems like a simple pedal, but this thing is capable of doing so much: from traditional spring reverb to wobbly/soupy soundscapes; it’s just a beautiful piece of gear. I use a lot of reverb (to much, actually) so I’ve hooked it with a favourite switch built by Drew Swindle (http://www.swindlereffects.com/) so I can have 2 presets on tap: the favourite switch has my regular plate reverb and the right switch on the flint has an 80s long/wet/glissed setting. For spring I use my Deluxe Reverb (foot switch pictured on the left). Tremolo-wise, the flint has a pretty extreme, almost chorus-like setting dialled in. For traditional tremolo I use the DRRI’s foot switch. Boss RC-2 Loop Station > I use it as a practice tool. A sturdy but complicated machine, it allows me to record ideas on the fly.